A simple, flavoursome version of classic teriyaki sauce, livened up with a kick of chilli and garlic. Coat the mackerel fillet in flour, and place in a frying pan with some oil. 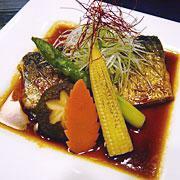 Place the vegetables with the mackerel in the frying pan. Once the mackerel is cooked through, add the rest of the ingredients, coating the mackerel. When serving, piling julienned spring onions (white part) on top makes for an attractive look.